They happen to be four of our favorite actors and they were brought together under the same roof at the spectacular and amazing John Kerwin Kids’ Show. The wonderful John Kerwin Kids’ Show certainly can’t be beat and at the most recent show taping, pranks, lego creations, and a whole lot of fun took place at the brilliant show. Hosted by none other than the magnificent John Kerwin himself, the outstanding John Kerwin Kids’ Show is everyone’s favorite talk show. It’s the talk show for kids that we all can never get enough of – families and kids alike have oh, so much fun watching this terrific show. The most recent show taping took place on November 28, 2017 and it featured four, fantastic, special guests. Best Friends Whenever star Gus Kamp, Fuller House star Elias Harger, Raven’s Home star Isaac Ryan Brown and Walk The Prank star Brandon Severs had an incredible time at the marvelous John Kerwin Kids’ Show. The excellent kids that joined the live audience had an unforgettable time as they got the chance to get up close and personal with these amazing actors. They enjoyed seeing them get interviewed by the wonderful John Kerwin and even take on some fun activities. Gus Kamp showed off a super cool lego creation while Isaac Ryan Brown embraced his inner Hulk. The John Kerwin Kids’ Show never fails to be a memorable time for kids both at the live taping and those watching at home. Award-winning host, John Kerwin and his unrivaled flair for interviewing always makes each and every episode such a blast to watch. The John Kerwin Kids’ Show shared the extraordinary picture below of Gus Kamp on the show as seen on the show’s Instagram account. Elias Harger shared his awesome time on the show as seen in the picture he posted on Twitter below. Isaac Ryan Brown had a great time chatting it up on the John Kerwin Kids’ Show. Brandon Severs shared his excitement to be on the show and posted the exceptional Instagram post as seen below. I will be appearing on the @johnkerwinkidsshow @disney November 28 @ 4pm PCT. Look out for #funfilled interview with Josh and I! The John Kerwin Kids Show is like a late night show for kids!! The John Kerwin Kids’ Show is filled with a never-ending amount of pure fun and excitement. I, Alexisjoyvipaccess had another remarkable time covering the magnificent show taping and I can’t emphasize enough how sensational the John Kerwin Kids’ Show is. 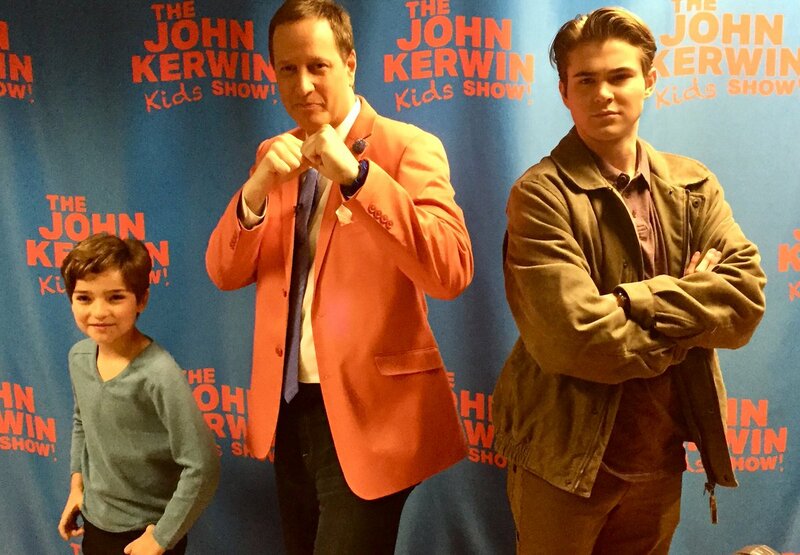 Be sure to follow the John Kerwin Kids’ Show on Twitter: @JohnKerwinLive and on Instagram: @JohnKerwinKidsShow and stay tuned on YouTube.com/alexisjoyvipaccess for interviews with your favorite celebrities from the show taping! Next Article: Get Ready For Some Awesome Talent In Rob Dyrdek’s New Show, “Amazingness” Premiering 12/8 On MTV!